Selling your Sevier County cabin or home. 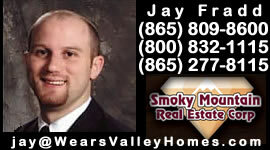 Smoky Mountain Realtor Jay Fradd lists property in Gatlinburg, Pigeon Forge, Sevierville, Wears Valley, New Center, Townsend, and Cosby. Area Sales Statistics Developments Disclosures & Contracts Foreclosures & Bank Owned Investments Jay's Expertise Land Property Search New Homes News Articles About The Smokies Services Provided Utility Information What's In It For Me?